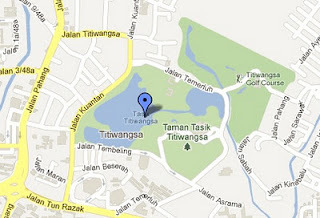 Lake Titiwangsa is a 10-minute walk east of the Titiwangsa monorail station. RapidKL bus B101 runs between Titiwangsa and KL Sentral, via Jln Cheng Lock in Chinatown. Bus B102 runs here from Jln Bukit Bintang and bus B103 runs here from the KLCC. Head to this relaxing recreational park surrounding Lake Titiwangsa for a picture postcard view of the city skyline. As well as relaxing walking paths and jolly boating on the lake (from around RM3 per hour), there are tennis courts, squash courts and a remote-controlled car racing track where enthusiasts stage miniature Formula 1s. The park is a favourite spot for courting Malaysian couples (and the religious police on the lookout for improper behaviour).